​Welcome to the Year of the Recorder! We start Grade 3 by reviewing rhythms and learning to read and write the notes on the staff. It is important for students to be able to read notes on the staff before we pick up the recorders because students will need to use the staff to help them learn and practice the recorder songs. After students have learned the notes on the staff, we then start learning how to play our recorder. All Newton Public Schools students are guaranteed a recorder provided by the school system. (If you wish to purchase an extra recorder for home practice or if your first one is lost, you can get one at Music and Arts in Newton Centre or online at Amazon). I will also be providing a music packet and practice log, and a folder to keep them in. It is necessary for students to bring both the recorder and recorder folder to each class. I recommend that each student leaves the recorder and folder in his or her backpack so that he or she can practice at home and won't forget either at home when it comes time for class. Recorder is an exciting and challenging time in elementary music. It's exciting because many students learn how to play their very own instrument for the first time. We also learn about what it means to play in an ensemble, be responsible for your own part, how to follow a conductor, how to put on a concert, and at the end, how to compose your own music using both rhythms and pitches. It is challenging because there are a lot of things to concentrate on going on at once: the student must read the notes, listen to the pitches he/she is making, listen to the pitches around him/her, blow air for each note, put his/her fingers down in the right combination, and pay attention to how fast or slow everyone is going. Imagine how good that must be for a young brain! Of course we learn each song and practice in class, but in order for students to get the most out of this year, it is extremely important to practice at home. That way, students can take time to practice what they need to practice instead of what the whole class needs to practice. They will come back to class feeling prepared and ready to move on to more challenges! For more information about what we learn in Grade 3, click on the Grade 3 Curriclum page. To find additional resources for music learning at home and extra recorder practice, click on the Grade 3 Resources page or Grade 3 Extra Practice. 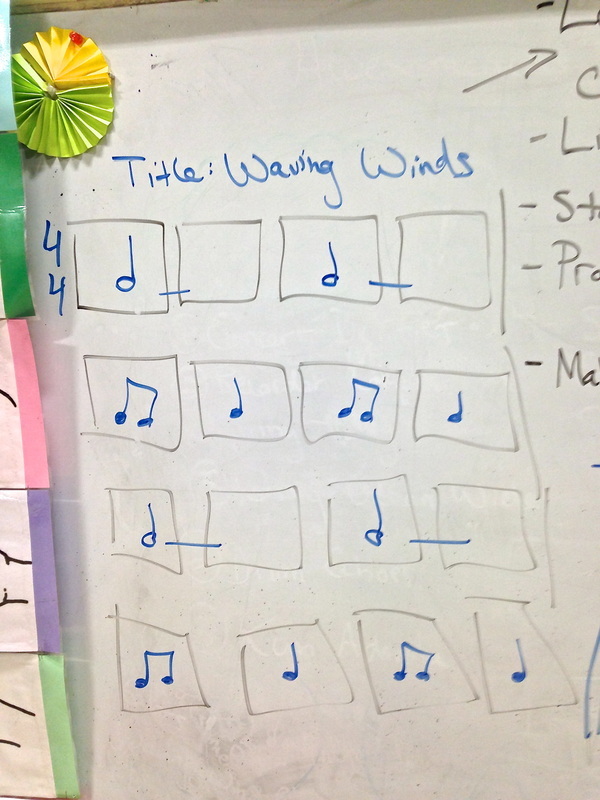 "Waving Winds"- Working on the rhythm for Mr. Harris' 3rd grade class recorder composition.